Georgia lost to South Carolina today by the score of 17-6. No excuses. The team that played better, executed better, tackled better, and was coached better won the game. As 'Stone Cold' says, "and that's the bottom line". The most surprising fact of the game was that the Bulldogs were still in the game until the Gamecocks tacked on a late field goal to secure the win. Georgia quarterback Aaron Murray played well, much better than a red-shirt freshman should be expected to play on the road in his first SEC encounter. UGA's veteran offensive line did play like freshmen, not resembling the effective unit the Dawg Nation had expected it to be. Georgia's defense made good adjustments at halftime, but the shoddy arm tackling was one of the Dawgs biggest letdowns. 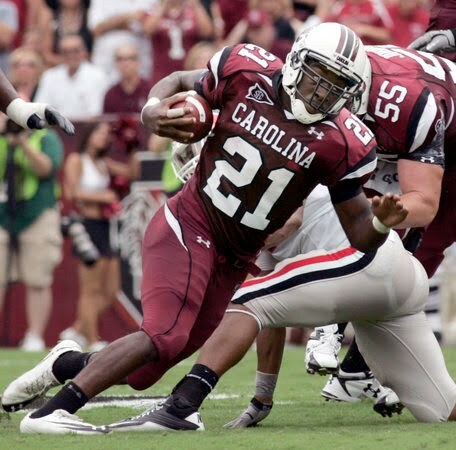 They did face the best running back they will see all season, and probably for the next two years as well, in Carolina's Marcus Lattimore (above). They also went up against Steve Spurrier's best team he's had in Columbia. They can legitimately win the Eastern Division this year, and I never thought I would say that about a Gamecock squad. Spurrier's or anyone else's. Their only test in the east will be playing Florida in the Swamp, but it's the best year to do that in a long time. They will also have to battle Auburn on the road, as well as 'Bama at home. As for Georgia, don't be so quick in writing them off after this loss. They were a horrible third down spot and a crucial lost fumble away from having this opening storyline changed. They have potential, but they must improve week by week, which translated means they must win each week. Right now they have to be a team that can handle adversity. Can they? Only time will tell. Stay tuned, because there's a lot of football to be played and one loss does not make or break a season.